Born in 1968, Lee Charley has been smithing silver since the mid-eighties. Lee is known for his dragonfly pins and necklaces. He is married and learned to smith silver from his mother. 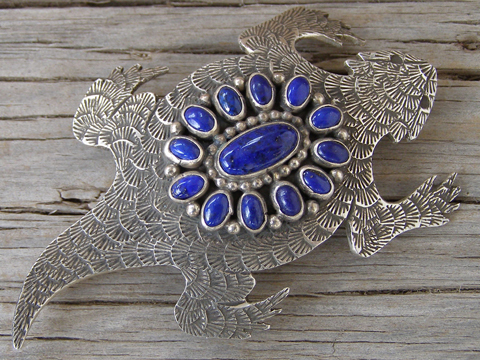 This horned toad pin and pendant is set with a cluster of lapis lazuli ovals on its back. Beautifully patterned stampwork marks the scaly body of this creature. In addition to the pin mechanism on back, it has a shepherd's hook so it can be worn on a chain as a pendant. Hallmarked LC and stamped Sterling on back. Lapis lazuli: center oval 1/2" x 7/32"; 10 ovals 3/16" x 1/8"
Width at hind legs: 1 3/4"
Length of pin mechanism: 1 3/8"